One of my husband's favorite authors is Robert Heinlein. Besides being a brilliant writer, he was a prescient observer of the human condition. I couldn't help but feel this was SO apt. How much harm do we do to our children by not requiring them to work for their money, or to take responsibility for their actions, or to understand the gravity of the choices they make? In some regards, children in the past had some advantages over children today. First of all, they were surrounded (mostly) by adults who modeled admirable qualities as a matter of daily life: hard work, self-control, clean speech, manners, etc. Material possessions were scarce by today's standards. I have no desire to embrace "the good old days," but there's no question today's abundant resources, trashy popular culture, and the ability to skate through life without taking personal responsibility for bad choices has impacted adults and children in negative ways. We've tried to cultivate the opposite: frugality, a pure culture, and personal responsibilities for our kids. By comparison to past hardships, our girls have undoubtedly had easy lives. Yet I hope we've imbued them with qualities that will serve them well as adults. We don't want to handicap them in that regard. 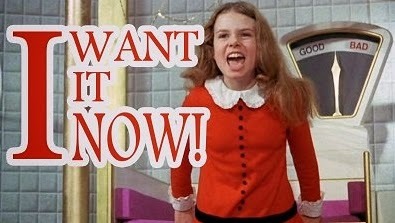 Should fall upon Veruca Salt? Is she the only one at fault? A girl can't spoil herself, you know. Who spoiled her, then? Ah, who indeed? To find out who these sinners are. Her loving parents, MUM and DAD. Methinks Robert Heinlein was right. Methinks you and Don are absolutely correct about Robert A. Heinlein, Patrice! He is and always has been my favorite author, as well. I first "discovered" his stories when my dad was reading Heinlein's "Puppet Masters." I was 11 years old and being curious about the picture on the paperback book's cover, I asked my dad about the story. He let me read it when he was through and I was totally enthralled! I still have that paperback, as well as most of the other early stories by Heinlein. When I was in the 7th grade in junior high school, I was browsing the school library when I came across the "young adult fiction" section. There I found "Red Planet" by Heinlein. I took it home and read it that weekend. I loved it! Monday, I took it back and checked out "Citizen of the Galaxy," then "Between Planets" and on and on. A "new" Heinlein book every weekend. I was in 7th Heaven! My parents never spent much time with me when I was growing up. I realized many years later that all the common sense and wisdom I'd learned as I grew through my teen years I received from Mr. Heinlein. He taught me right from wrong. How I should act in all situations and how OTHERS should act. He taught me how to be a decent human being and a man. We haul hay, feed livestock and currently have the corner of a 90 year old barn up on a couple of beams 3 floor jacks and a hydraulic jack. We concreted the top of the foundation to smooth it for a replacement sill... It is projects like this that have our 17 year old saying "Oh, oh - sounds like more "character building" for me.....!" Or "You mean I don't already have enough "character"....? The best part of course is that people have always thought we have some very nice children.....and now young adults (the other is 20).. I couldn't agree more. I work with young people who have gotten into trouble with things like drugs, alcohol, shoplifting etc. The kids are fairly easy to work with...the parents not so much. It's frustrating because I know it's likely they will reoffend because the parents don't instill the respect of the law, others and themselves the kids truly need. In "The Good Old Days," children were seen and not heard. They also were considered and treated as adults at an earlier age then today. Through the perpetual prodding of the change agents through media and education, children, who should be acting as adults, instead have a protracted adolescence.